250 to assemble the gun in 3 days (54 hours), 2,500 to lay track and dig embankments. 2 flak battalions to protect the gun from air attack. Schwerer Gustav (English: Heavy Gustaf) was a German 80-centimetre (31.5 in) railway gun. It was developed in the late 1930s by Krupp in Darłowo (then Rügenwalde) as siege artillery for the explicit purpose of destroying the main forts of the French Maginot Line, the strongest fortifications in existence at the time. The fully assembled gun weighed nearly 1,350 tonnes (1,490 short tons), and could fire shells weighing 7 t (7.7 short tons) to a range of 47 km (29 mi). 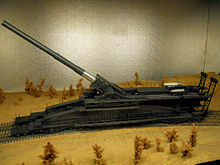 The gun was designed in preparation for the Battle of France, but was not ready for action when the battle began, and in any case the Wehrmacht's Blitzkrieg offensive through Belgium rapidly outflanked and isolated the Maginot Line's static defenses, eventually forcing the French to surrender and making their destruction unnecessary. Gustav was later deployed in the Soviet Union during the Battle of Sevastopol, part of Operation Barbarossa, where, among other things, it destroyed a munitions depot located roughly 30 m (98 ft) below ground level. The gun was moved to Leningrad, and may have been intended to be used in the Warsaw Uprising like other German heavy siege pieces, but the rebellion was crushed before it could be prepared to fire. Gustav was destroyed by the Germans near the end of the war in 1945 to avoid capture by the Soviet Red Army. Schwerer Gustav was the largest-calibre rifled weapon ever used in combat and, in terms of overall weight, the heaviest mobile artillery piece ever built. It fired the heaviest shells of any artillery piece. 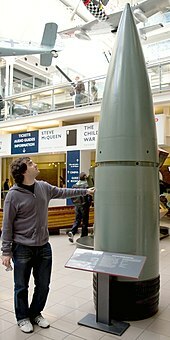 It is surpassed in calibre only by the unused British Mallet's Mortar and the American Little David bomb-testing mortar—both at 36 inches (91.5 cm)—but was the only of the three to be used in combat. In 1934, the German Army High Command (OKH) commissioned Krupp of Essen to design a gun to destroy the forts of the French Maginot Line that were nearing completion. The gun's shells had to punch through seven metres of reinforced concrete or one full metre of steel armour plate, from beyond the range of French artillery. Krupp engineer Erich Müller calculated that the task would require a weapon with a calibre of around 80 cm, firing a projectile weighing 7 tonnes from a barrel 30 metres long. The weapon would have a weight of over 1000 tonnes. The size and weight meant that to be at all movable it would need to be supported on twin sets of railway tracks. In common with smaller railway guns, the only barrel movement on the mount itself would be elevation, traverse being managed by moving the weapon along a curved section of railway line. Krupp prepared plans for calibres of 70 cm, 80 cm, 85 cm, and 1 m.
Nothing further happened until March 1936 when, during a visit to Essen, Adolf Hitler inquired as to the giant guns' feasibility. No definite commitment was given by Hitler, but design work began on an 80 cm model. The resulting plans were completed in early 1937 and approved. Fabrication of the first gun started in mid-1937. Technical complications in the forging of such massive pieces of steel made it apparent that the original completion date of early 1940 could not be met. Krupp built a test model in late 1939 and sent it to the Hillersleben proving ground for testing. Penetration was tested on this occasion. Firing at high elevation, the 7.1 tonne shell was able to penetrate the specified seven metres of concrete and the one metre armour plate. When the tests were completed in mid-1940 the complex carriage was further developed. Alfried Krupp, after whose father the gun was named, personally hosted Hitler at the Rügenwalde Proving Ground during the formal acceptance trials of the Gustav Gun in early 1941. Two guns were ordered. The first round was test-fired from the commissioned gun barrel on 10 September 1941 from a makeshift gun carriage at Hillersleben. In November 1941, the barrel was taken to Rügenwalde [de], now Darłowo, Poland, where eight further firing tests were carried out using the 7,100 kilogram armour-piercing (AP) shell out to a range of 37,210 metres. In combat, the gun was mounted on a specially designed chassis, supported by eight bogies on two parallel railway tracks. Each of the bogies had 5 axles, giving a total of 40 axles (80 wheels). Krupp christened the gun Schwerer Gustav (Heavy Gustav) after the senior director of the firm, Gustav Krupp von Bohlen und Halbach. The gun could fire a heavy concrete-piercing shell and a lighter high-explosive shell. An extremely-long-range rocket projectile was also planned with a range of 150 km, that would require the barrel being extended to 84 metres. In keeping with the tradition of the Krupp company, no payment was asked for the first gun. They charged seven million Reichsmark (approximately 24 million USD in 2015) for the second gun, Dora, named after the senior engineer's wife. In February 1942, Heavy Artillery Unit (E) 672 reorganised and went on the march, and Schwerer Gustav began its long ride to Crimea. The train carrying the gun was of 25 cars, a total length of 1.5 kilometres (0.9 mi). The gun reached the Perekop Isthmus in early March 1942, where it was held until early April. The Germans built a special railway spur line to the Simferopol-Sevastopol railway 16 kilometres (9.9 mi) north of the target. At the end of the spur, they built four semi-circular tracks especially for the Gustav to traverse. Outer tracks were required for the cranes that assembled Gustav. Fort Stalin. Six shells fired. Fort Molotov. Seven shells fired. "White Cliff" also known as "Ammunition Mountain": an undersea ammunition magazine in Severnaya ("Northern") Bay. The magazine was sited 30 metres under the sea with at least 10 metres of concrete protection. After nine shells were fired, the magazine was ruined and one of the boats in the bay sunk. Firing in support of an infantry attack on Südwestspitze, an outlying fortification. Seven shells fired. Fort Siberia knocked out of action. Five shells fired. Maxim Gorky Fortresses bombarded. Maxim Gorky 1 knocked out of action, Maxim Gorky 2 damaged. Five shells fired. By the end of the siege on 4 July the city of Sevastopol lay in ruins, and 30,000 tons of artillery ammunition had been fired. Gustav had fired 48 rounds and worn out its original barrel, which had already fired around 250 rounds during testing and development. The gun was fitted with the spare barrel and the original was sent back to Krupp's factory in Essen for relining. The gun was then dismantled and moved to the northern part of the eastern front, where an attack was planned on Leningrad. The gun was placed 30 km (18.6 mi) from the city near the railway station of Taizy. The gun was fully operational when the attack was cancelled. The gun then spent the winter of 1942/43 near Leningrad. Dora was the second gun produced. It was deployed briefly against Stalingrad, where the gun arrived at its emplacement 15 kilometres (9.3 mi) to the west of the city sometime in mid-August 1942. It was ready to fire on 13 September. It was withdrawn when Soviet encirclement threatened. When the Germans began their long retreat they took Dora with them. The Langer Gustav was a long cannon with 52 centimetre (20.5 in) calibre and a 43-metre barrel. It was intended to fire super-long-range rocket projectiles weighing 680 kilograms to a range of 190 kilometres (118 mi). This gave it the range to hit London from Calais, France. It was never completed after being damaged during construction by one of the many RAF bombing raids on Essen. The Monster was to be a 1,500 tonne mobile, self-propelled platform for an 80-cm K (E) gun, along with two 15 cm sFH 18 heavy howitzers, and multiple MG 151 autocannons normally used on combat aircraft. It was deemed impractical, and in 1943 was canceled by Albert Speer. It never left the drawing board and no progress was made. It would have surpassed the Panzer VIII Maus (heaviest tank ever built) and the Landkreuzer P. 1000 Ratte (never built) in weight and size. On 14 April 1945, one day before the arrival of US troops, Schwerer Gustav was destroyed to prevent its capture. On 22 April 1945, its ruins were discovered in a forest 15 kilometres (9.3 mi) north of Auerbach and about 50 kilometres (31 mi) southwest of Chemnitz. In summer 1945 Schwerer Gustav was studied by Soviet specialists and in autumn of the same year was transferred to Merseburg, where the Soviets were gathering German military material. Thereafter, the trail of the gun was lost. In March 1945, Dora was transferred to Grafenwöhr and was blown up there on 19 April 1945. The debris was discovered by American troops some time after the discovery of Schwerer Gustav. The debris was scrapped in the 1950s. Part of the third (52 centimetre) gun was found after the war in the Krupp production facilities in Essen. The world's largest "Dora ensemble" is located in the Military History Museum of the Bundeswehr in Dresden. 7 m (23 ft) of concrete at maximum elevation (beyond that available during combat) with a special charge. The main body was made of chrome-nickel steel, fitted with an aluminium alloy ballistic nose cone. 80 cm "Schwerer Gustav" (Heavy Gustav) - Deployed in March 1942 against Sevastopol. 80 cm "Dora" - Deployed against Stalingrad in September 1942. Possibly never fired. 52 cm "Langer Gustav" (Long Gustav) - Started but not finished. ^  Self-Propelled Dora; An article on the self-propelled version of the Dora. ^ "80 cm cannon "Dora"". hpwt.de. ^ Hahn, Fritz (1986). Waffen und Geheimwaffen des deutschen Heeres 1933–1945. (Band 1: Infanteriewaffen, Pionierwaffen, Artilleriewaffen, Pulver, Spreng- und Kampfstoffe.). Koblenz: Bernard und Graefe. p. 191. ISBN 3-7637-5831-3. ^ "De Schwerer Gustav A Dora". free.fr. ^ Taube: Eisenbahngeschütz DORA. p. 92. ^ Taube: Eisenbahngeschütz DORA. p. 99–100, 107. ^ "Журнал Техника и вооружение 2009 № 07 - стр 22". profilib.net (in Russian). Retrieved 7 February 2018. Engelmann, Joachim (1993). German Railroad Guns. Armor in Action. 15. Squadron/Signal Publications. ISBN 978-0897470483. Taube, Gerhard (1979). Eisenbahngeschütz DORA. Das größte Geschütz aller Zeiten (in German). Stuttgart: Motorbuch-Verlag. ISBN 3-87943-648-7. Wikimedia Commons has media related to 80 cm K gun (Krupp). This page was last edited on 30 March 2019, at 16:17 (UTC).